The high performance Magnum 6KM base unit comes with four 10/100 M12 copper ports (either regular or PoE). Up to four 100Mb fiber ports or up to four more 10/100 M12 copper ports, or combinations, may also be configured. Two Gigabit ports may also be configured with 10/100/1000 M12 copper ports or LC-type fiber. 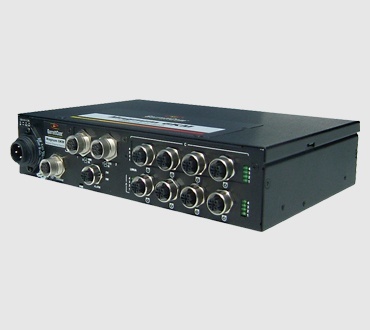 Designed for Mobile Networking - Rugged Package that includes M12 connectors (in lieu of RJ45) to withstand shock & vibration. Robust Software - Full featured MNS-6K Software in a Compact Package. Configurable - Available with 10/100 copper, PoE, fiber, and Gb copper or fiber. Power Flexibility - DC at 110V for railways, 12V, 24V, 48V, 125V, 250V, Dual-Source; Universal AC.